An atheist group from Chicago has set up a bizarre anti-Christian nativity scene in a bid to “keep state & church separate.” The scene depicts Founding Fathers Benjamin Franklin, Thomas Jefferson and George Washington gazing adoringly at a baby “Bill of Rights,” which is laid in a straw-bedded manger. Traditionally, as is the case across the country during holiday season, a Christian nativity scene was set up outside the Chicago courthouse. That was until, in 2015, a complaint from FFRF sparked immediate change. “In Illinois the county’s sheriff has custody of the courthouse. In 2013 we received a letter from the Freedom From Religion group in Wisconsin stating we had a manger alone on the lawn,” Assistant State’s Attorney Perry Rudman said back in 2015, according to the Morris Herald. “They questioned the laws and cited various court cases supporting the removal,” he added. 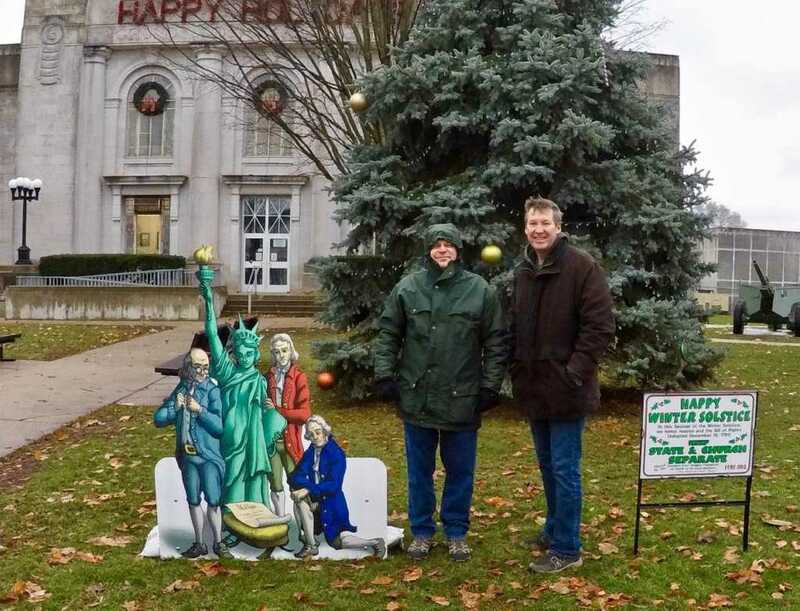 “The display exemplifies the take-charge spirit of members of the freethought organization, who often assemble such installations in their hometowns to counter religious tableaus on public land,” the FFRF said in a news release on the nativity scene. But not everyone is on board with their militant atheistic agenda. Yesterday, the Twitter-active group called out Arkansas Sen. Jason Rapert for his work to gather Christian lawmakers together for common good. FFRF was likely not expecting a reply from the man himself, but boy did they get one! “Your extreme agenda has convinced millions of Americans that we must take a stand to honor the Judeo-Christian foundation of our nation,” he concluded.